Earned All-SEC team and All-SEC Freshman Team accolades for her performance at the SEC Championships on uneven bars with a score of 9.825 … Made her collegiate debut against LSU Jan. 5 with a score of 9.800 on the uneven bars and 9.825 on the balance beam … Scored a personal-best 9.925 on uneven bars and a personal-best 9.875 on balance beam against Arizona on March 2 …. Competed on uneven bars with a score of 9.825 and balance beam with a score of 9.750 at the NCAA Regionals on April 7 … Posted a 9.8375 on bars and a 9.6750 on beam at the NCAA Championships … Competed on the bars in every meet in 2018, scoring a 9.800 or higher in 11-of-14 meets. Born in Saskatoon, Saskatchewan and now resides in Kings Mountain, North Carolina … First In Flight Gymnastics in Gastonia, North Carolina … Competed at both Level 10 in the United States and elite in Canada … Finished second in the all-around (38.550), first on balance beam (9.775), first on bars and second on vault at the North Carolina Level 10 State Championship in the spring of 2016 … Concluded her season at the Region 8 Level 10 Championships, sweeping first place in the all-around (38.800), bars (9.775), beam (9.725) and floor exercise (9.800) … Member of the Canadian National Team … First-place scores at Regionals all ranked among the top Level 10 scores in the nation in 2017 … Competed at the Level 10 Junior Olympic Nationals in 2013 and 2014 … Member of the Canada National Junior Team and was selected to represent Canada at the 2014 Coupe Avenir in Malmedy, Belgium, finishing third in the all-around and first on bars, and at the 2014 Top Gym Tournament in Charleroi, Belgium, finishing second in the all-around. 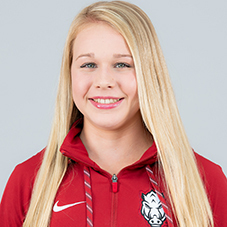 Daughter of Scott and Jodi Laird and attends Schul Yeshua … Homeschooled program in Kings Mountain, North Carolina … Plans to major in kinesiology … First Arkansas gymnast from Canada and the first foreign-born gymnast overall in program history.